In this July 17, 2013 picture, a team of anthropology students from the University of Maryland perform an excavation in Easton, Md., in hopes of finding evidence that might prove the state was home to the first free African-American community in the nation. Archaeologists and students involved in the excavation believe an Easton neighborhood known as The Hill may predate Treme, a New Orleans neighborhood currently recognized as the nation’s oldest free black community, by two decades or more. The house where the excavation is taking place dates to at least 1793. It was owned in 1800 by a white man named James Price, and was home to three free non-white residents, according to the 1800 Census. Photo Credit: The Associated Press, Patrick Semanksy. EASTON, Md. (AP) – Did the first free slaves live in Maryland and formed the nation's first free African-American community? Archaeology students have been sifting through a little patch of ground on Maryland's Eastern Shore this summer, seeking evidence that it was home to the nation's first free African-American community. Historians say hundreds of free blacks once lived in the area, while plantations flourished with hundreds of black slaves not far away. The students from the University of Maryland, College Park, and Morgan State University have been digging behind what is now the Women's Club of Talbot County. The building, part of which dates to at least 1793, was home to three free non-white residents, according to the 1800 Census. "We also know that by around 1790 there were a few free African Americans who were actually purchasing property in this neighborhood," said Stefan Woehlke, a doctoral student at the University of Maryland who has been working at the site. "And so we're excavating here, one, to figure out what their lives were like and also to better understand the community more broadly in order to help support the claim that this is the oldest free African-American community in the United States." Harriette Lowery, who lives about three miles from Easton, appreciates the effort to unearth a portal into history. She traces her ancestry to a man named William Demby, a slave whose murder was recounted in "Narrative of the Life of Frederick Douglass" by the Maryland native and famed abolitionist. Lowery said establishing that free blacks and whites were able to live together at a time when slavery existed nearby would be invaluable. "It shows the strength of the African-American people that were here, because they were smart enough and courageous enough that if they were enslaved they were able to emancipate themselves either through their owners or through the will of their own, and to stay in the community. That says something about the community - the black and white community - that they were able to stay in the community and survive and thrive," Lowery said. 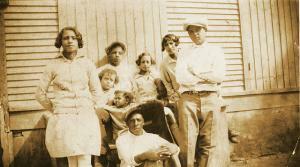 Maryland's Eastern Shore is rich in African-American history. Douglass was born into slavery in 1818 in Talbot County, and fellow abolitionist Harriet Tubman was born in in Dorchester County. Currently, the Treme neighborhood in New Orleans is recognized as the nation's earliest free black community, dating to 1812. Archeologists at the University of Maryland and researchers at Morgan State believe the Easton neighborhood known as The Hill may predate Treme by two decades or more. The students have been searching the yard for evidence that one of the black residents may have worked as a blacksmith on the property. They have unearthed raw materials for making nails, something blacksmiths would have used. Mark Leone, a University of Maryland archaeologist who is leading the excavation, notes that records suggest extreme contrasts in the area, where free blacks and enslaved blacks lived near to one another. "Our excavation may confirm this picture and uncover some of the striking social nuances," said Leone, who also directs the Archaeology in Annapolis program. Leone said it could take years to determine whether The Hill predates Treme. To make the determination, a network of scholars who specialize in African-American history would be consulted once enough evidence is gathered, Leone said. Tracy Jenkins, another doctoral student who has been working at the site, said the project also seeks to fill in some blanks in the historical record concerning free blacks in Easton. "What we're trying to do is to correct that, to do the research that needs to be done and the archaeology here is part of a much larger project that involves oral history, since we have families living here on The Hill whose last names are the same as those in the 1790 Census," Jenkins said. "Families have been here for a long time." Woelke said the community likely began to develop after Methodists and Quakers who lived in the area freed slaves in the 18th century. Dale Green, a professor of architectural history and preservation who has studied Talbot County records and Census data, estimates that 410 free black residents lived in the neighborhood by 1790. "A measure of unity existed among some religious and racial groups," Green said. "Perhaps the objects they left behind can give a voice to these unsung social pioneers." Priscilla Morris is an officer with the local preservation group Historic Easton and has been studying the neighborhood history for more than 10 years. She is hopeful that archaeology will call attention to its historic value and help protect it from development that could obliterate a priceless heritage. Concern about efforts to redevelop the area led to the founding of Historic Easton, and the group is funding the research and the excavation. "There is potential to save the built environment by digging up the cultural significance," Morris said. "I expect renewed and expanded pride of place to follow. Kids are chasing professor Green during his walking tours this summer and asking him: 'Are we really the oldest?'" History and archaeology student Brittany Hutchinson said it has been rewarding to see people drop by the site and take an interest in Easton's history. "It's an amazing experience to have because we're really working to discover and sort of give the heritage back to the area of Easton," Hutchinson said.